The flashes of memory that return to Carrie Wallace as she lies bloodied in the street all share a common trait: Each culminates in an insincere apology. A casual bump in the street, a father’s indifference, a boyfriend’s exit, youthful disappointments. But despite her lifetime’s experience, she holds out hope that she may yet witness a true expression of remorse. 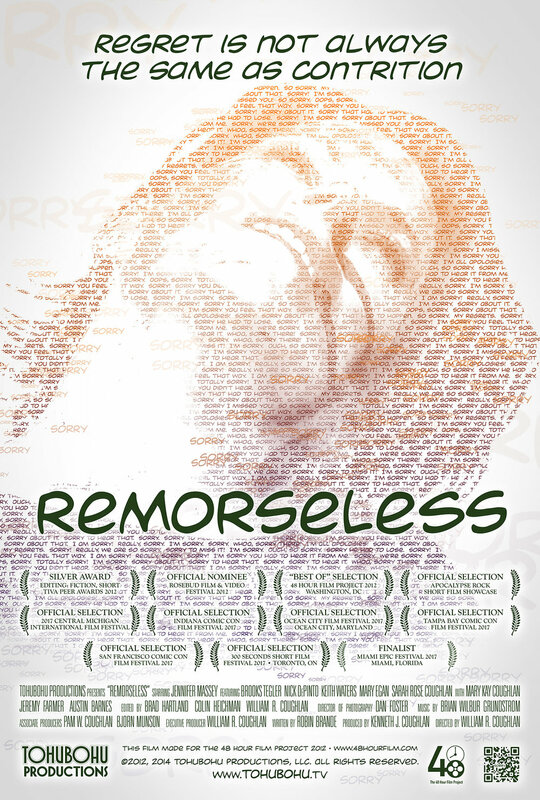 Tohubohu ventured into 48 Hour Film Project waters again in 2012 with “Remorseless” (originally titled “At Last”), an intense drama — anchored by a star performance by Jennifer Massey — created entirely across the weekend of May 4th through the 6th, 2012. Returning scriptwriter Robin Brande and director William R. Coughlan were joined by Tohubohu “legal eagle” Kenneth J. Coughlan in the producer’s chair. Dan Foster returned as director of photography (traveling halfway across the country to do so), assisted by experienced videographer Andrew Albosta. And Dylan Hintz cemented a place in our (admittedly small-scale) history as Tohubohu’s very first stunt coordinator. The film premiered at the AFI Silver Theatre on Friday, May 11th.